A must for heavy-duty work. 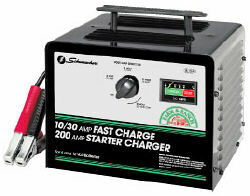 High output, portability and 6 and 12 volt capabilities make this a popular all-steel, bench-style charger. 200 amp engine start means you can start an engine in the dead of winter. This product works well with: Autos, Light Trucks, Tractor & Farm Equipment, RV's, Large Trucks and other 6 & 12 volt batteries. 13 X 12 X 10 5/8"